Higher speed and superb image quality powered by the VQ-engine gradient. 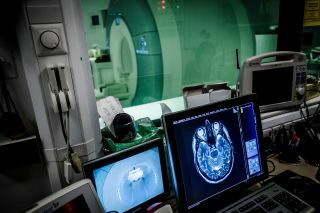 The AVIC specification includes multi-channel coils for both neuro, vascular and cardiac imaging coupled with advanced software application available for both neuroimaging and cardiac imaging. The Artis zee biplane system with mixed sized flat plate detectors allow you to utilize the smaller lateral flat detector in connection with a larger rotatable AP (anterior-posterior) detector whilst offering excellent coverage and flexibility for a broad applications spectrum, including neuro, cardiac, spine and abdominal imaging. Like the AVIC MRI Scanner, it has been purchased with high end software which allows DynaCT and DynaPerfusion to be performed. These two imaging modalities are conjoined using the Siemens MIYABI functionality. With the unique transfer shell system of Angio-MR MIYABI, patient transfer from one system to the other is fast, smooth and easy. 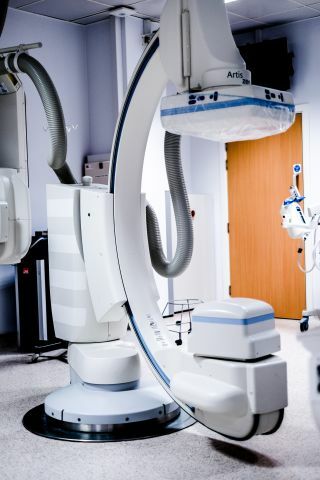 Once the decision for MR imaging has been made, the angio table and C-arm can be switched into the transfer position at the touch of a button. Specially designed, floor-embedded motorized rails enable the angio table of Angio-MR MIYABI to be conveniently moved toward the dividing doors between the two suites. When the doors are opened, the patient shell is moved onto the MR tabletop and locked into position, ready for transfer into the scanner. This allows easy imaging using both modalities in turn without the need to transfer the patient off either examination table. If you wish to book the seminar room and have access to Calpendo you are welcome to add your own booking. Alternatively, please contact the Operations Manager. This room is on level two of AVIC and has a patient couch, desk and chairs for follow-up appointments to take bloods, ECG etc. This is bookable through the Operations Manager or the MR Radiographers.